Mayor Bill de Blasio (Official NYC Photo) Feb. 4, 2016. Governors is a 172-acre oasis in New York Harbor that has a history as long as New York City itself. It was a fishing camp for the very first New Yorkers, the Native Americans, and then in May 1624 it became the birthplace of our city when the first Dutch settlers arrived there and christened it New Netherland. Those thirty families who set foot on the shores of Governors Island almost 400 years ago made their arduous voyage in search of opportunity. They planted the seeds of a city that would grow to be a place for everyone. And just as our city has grown, Governors Island should grow. It should grow again as a place of opportunity for New Yorkers. Today we pledge to make Governors Island a place where economic opportunity comes together with innovation, education, and creativity. We will revive the beautiful buildings in the Historic District that celebrate New York City’s past, and look to the future, through millions of new square feet for commerce, and culture, and research. This will create tens of thousands of jobs and enable 365-day a year access for all New Yorkers for the first time in the island’s history. It will create a place where a young bio-medical scientist might develop a cure for diabetes. Or a tech entrepreneur might innovate a gravity-powered light bulb. This will help us to meet the challenges we face right here in New York City. Building on the success of Cornell-Tech, and advancing the City’s efforts to redevelop our waterfront, the City will work with the Trust for Governors Island to issue an RFP (Request For Proposals) for a comprehensive plan to develop up to 33 acres on two development zones situated on the southern end of the Island, and reactivate the 900,000 square feet of existing space in the Historic District on the northern end of the Island. While most of the attention on his speech was focused on city problems, such as law enforcement and mental health, many looked to the mayor for a long-awaited announcement for a cross-Borough light rail system, the BQX. This was announced as well, but the Governors Island portion offered no news, just a promise to look for more opportunities. What does the mayor’s statement mean? Let’s look at it. The Trust For Governors Island has been working diligently to look for developers for the many acres of open space in the Development Zones. As the new park was built around them, the city wasn’t exactly forgetting about the development needed to sustain Governors Island. The Trust did sign a contract with a spa to move into three buildings in the Historic District. Perhaps now, with a push by de Blasio, more staff or a development czar will be appointed under Leslie Koch, who oversees The Trust and has done so much good work to develop the parks and programs. 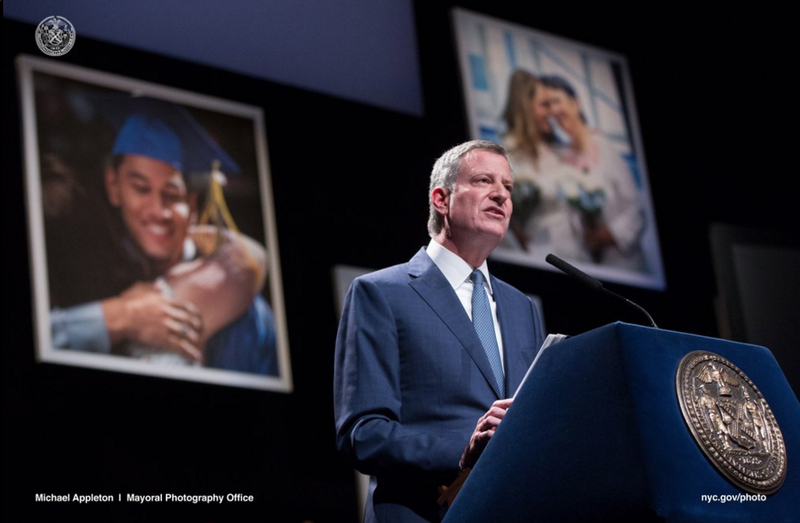 What does this new de Blasio imitative spell out for the Island? In the Historic District, it could be that finally a college or some school will take over Liggett Hall, possibly the biggest empty building in the state. Could the yellow 19th century officer homes around Nolan Park see temporary occupants, as offices, or study centers? But the big push sounds like it is aimed at the underused Development Zones. This is where new structures will rise, and where the potential to reshape the Island once more will happen. In the 106 years that the landfill portion of Governors Island has been open, this space has been used for practically every possible activity. It was an airstrip for Wilbur Wright, a polo pony field, had a tiny railroad, rows of warehouses, and cozy apartments for Coast Guard families. If a developer comes in, it will be to erect many new buildings. The mayor is following in the footsteps of his predecessors. While Rudy Giuliani asked President Clinton about its future, it was Mayor Mike Bloomberg who was on the Island to oversee the planting of more than 2,000 new trees. The objective is to foster complementary uses that animate and support open space, accommodate the growth of the 21st century innovation economy, create economic opportunities for New Yorkers, and transform the Island into a year-round destination for the public for the first time in its history. We hope that some good comes out of this speech, and positive change that is good for Governors Island and the city happens.